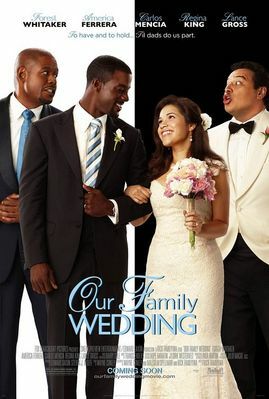 I watched this hilarious comedy last night called, "Our Family Wedding." Rarely do you get a movie about an African-American family and Latino Family joining together through comedy. Academy Award winner Forest Whitaker (The Last King of Scotland), who's surprisingly really funny, and Carlos Mencia ("Mind of Mencia") star in this clash-of-cultures comedy about two overbearing dads who must put aside their differences to plan a wedding for their children, Marcus (Lance Gross; Meet the Browns) and Lucia (America Ferrera; "Ugly Betty"). As the wedding brings out the best and worst in both families, the young couple soon discovers the true meaning of love and finds there is truth to the saying - that when you marry someone, you marry their entire family. Its really a great family story and it will have you laughing out loud. "Our Family Wedding" is available on DVD now.